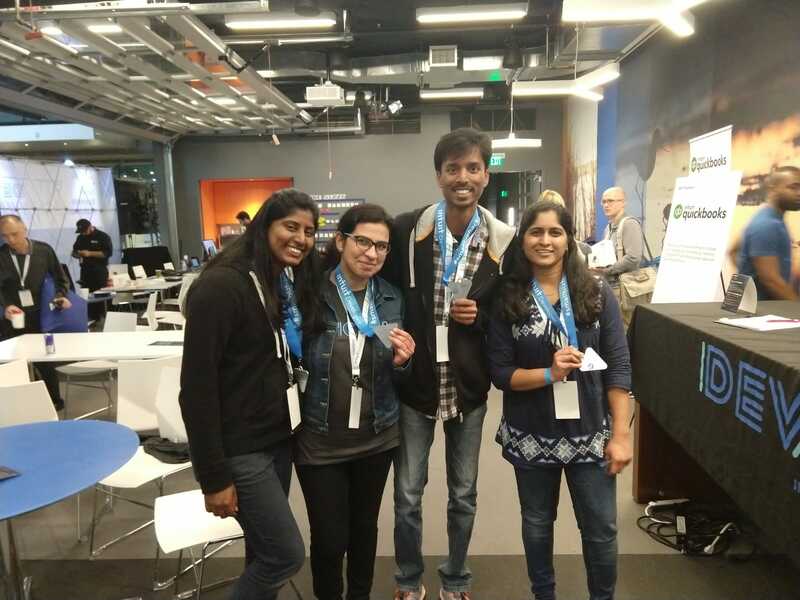 This month was the SmallBizHack hackathon at Intuit's headquarters in Mountain View, an event where over 200 hackers converged to tackle one objective: hack out a project that helps small business owners run their operation. Clarifai was on-site as an official API partner. Team SnappTag won 3rd place overall using Clarifai as an image recognition service to automate inventory management. I caught up with the winners to hear about how they made their app and what's next for them. Skip: Congratulations on winning! How did you form your team? SnappTag: We are MS Computer Science students of CSU East Bay. We all love challenges and know each other's strengths. The idea of creating solutions that create impact and help small business save time and money was very interesting, so we decided to participate. Skip: Can you tell us a bit more about project SnappTag? SnappTag: SnappTag is an easy-to-use solution, which helps small online businesses to save the time and effort required to create product tags and descriptions. It does this by automatically generating tags (via Clarifai) using product images snapped by the owner. Skip: What inspired you to take on this project? SnappTag: The project was inspired by our research into problems faced by small business. Most online business owners complained of their products not showing in searches. Our analysis showed that language barriers played a major role. After much deliberation we found this problem has deep roots, with more than 51 million non-native english-speaking business owners in South Asia. We wanted a solution that would create a real impact for these people. Skip: How does SnappTag work, technically speaking? Skip: What was it like working with the Clarifai API? SnappTag: The best part of using Clarifai API is the good documentation and ease of use for calling the different function APIs. Integration of Clarifai to our project was very easy and smooth. Skip: What did you think about the hackathon? SnappTag: It was great platform to think about real problems, apply innovation, and come up with a solution in a limited time that would create impact. It allowed us to be creative, learn new technologies, implement new ideas, and work as team. It also gave us opportunities to interact with other developers, to work directly with mentors of different partner APIs, and to be part of the developer community. Skip: Anything else you would like to say? SnappTag: We personally want to thank Skip from Clarifai and the other API partner mentors for their guidance and help during our development and the SmallBizHack QBconnect team for the wonderful opportunity. Skip: Thanks for sharing more about SnappTag with us, and big congratulations for winning 3rd place out of over 30 teams! An impressive accomplishment and well-earned. Are you interested in using Clarifai's AI vision for your own project? Join us in Toronto on December 1st for the next Intuit SmallBizHack! Can't make it? Sign up for Clarifai and try it out on your own. You can call the Clarifai API up to 5,000 times every month for absolutely zero cost. What are you waiting for? Get hacking!